The U.S. Navy has tested a new Littoral Combat Group concept for a coordinated deployment of disaggregated forces, USNI News reported Thursday. In late 2018, the service branch deployed San Antonio-class amphibious transport dock USS Somerset along with Arleigh Burke-class destroyer USS Wayne E. Meyer to support ground forces in South America. The U.S. 3rd Fleet said the Littoral Combat Group 1 tested the command and control of assets under a single commander. 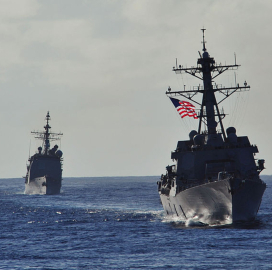 The deployment enabled the Navy to learn how attack and transport ships can support ground forces in certain operations, such as law enforcement detachment and humanitarian assistance. The Navy plans to use the lessons learned from the test to create a proposal to use the LCG concept in future operations. The service is also working on how the Marine Corps can battle for sea control from ashore by coordinating submarines, surface ships and ground forces.